In a bowl, mash the avocado with a fork. Then mix in the chicken and salt and pepper. 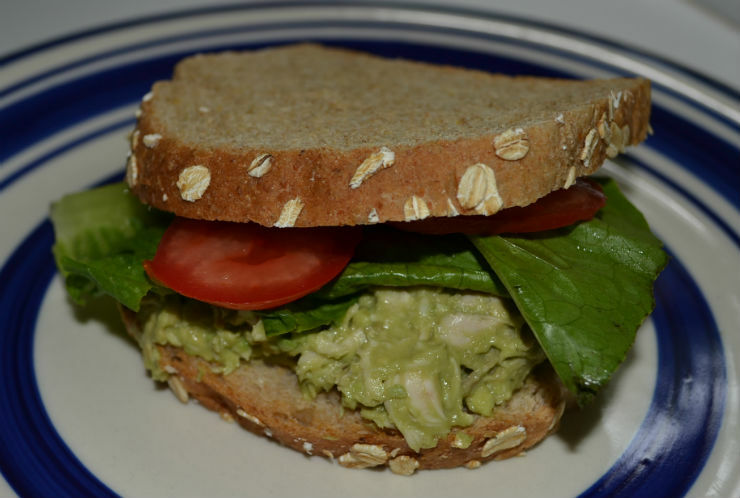 Put some avocado chicken salad on the toast, and add some lettuce and tomato if you’d like! Quick, easy, healthy, and delicious. I also just heard that avocados can possibly protect against some cancers! Eat up! In a large nonstick pan, heat 1 tbsp oil over medium heat. Add eggplant; cook 2-3 minutes on each side or until tender and lightly browned. Remove from pan. In same pan, heat 2 tbsp oil over medium heat. Add mushrooms; cook and stir 2-3 minutes or until tender. Add garlic, salt and pepper; cook for 1 minute longer. Remove from pan; wipe clean. In a shallow bowl, whisk eggs and milk. Spread 1 tbsp herb cheese over each clice of bread. 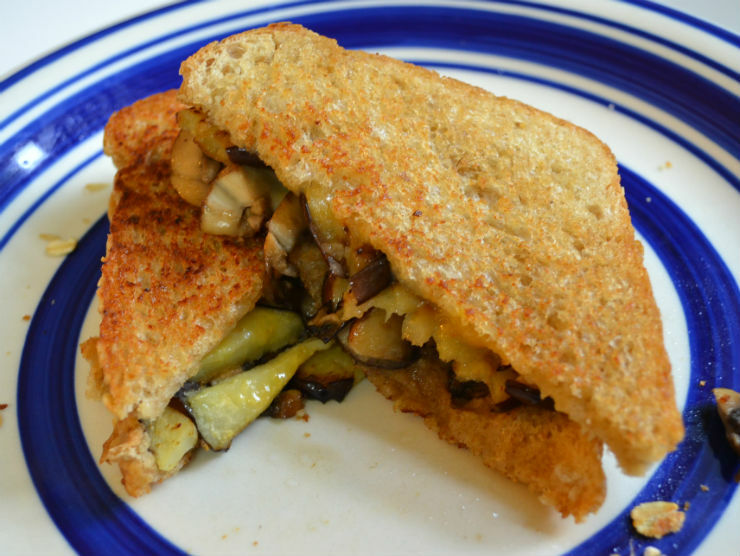 Layer four slices with eggplant and mushrooms; top with remaining bread. In same pan, heat 1 tbsp oil over medium heat. Carefully dip both sides of sandwiches in egg mixture, allowing each side to soak 5 seconds. Place two sandwiches in skillet; toast 2-3 minutes on each side or until golden brown. Repeat with remaining oil and sandwiches. This sandwich was absolutely delicious comfort food! I did switch a few things up in the recipe. I did not use the cream cheese. Instead I used regular cheese slices. I also did not do the milk and egg mixture. I instead buttered the outsides of the bread to toast it in the pan like a grilled cheese.